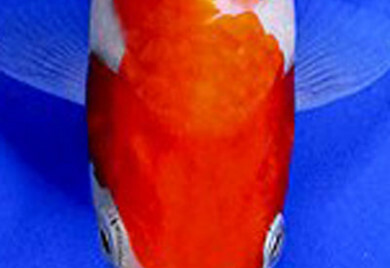 Kokaku, the oldest and most well known variety of koi, have a solid white base with patterns of red overlaid on top of the white. Top quality Kohaku display a bright, blemish-free white combined with deep, vibrant red tones. The even distribution of the pattern along the body is also very important. The beauty of a Kohaku lies in the purity of it’s white body and the depth and intensity of the red patterns. The edges of the red markings should be crisp and clear against an unblemished white background. This crisp edge is referred to as the “kiwa”. Tancho: A single red crown-like marking in the center of the head. Kuchibeni: Literally “lipstick”, indicates red (beni) on the mouth. Kohaku are quite sensitive to water condition. If the water hardness is too high, small black freckles called “shimi” can form on the skin. Softer water will not only prevent shimi from forming but will also encourage the development of the red (beni). 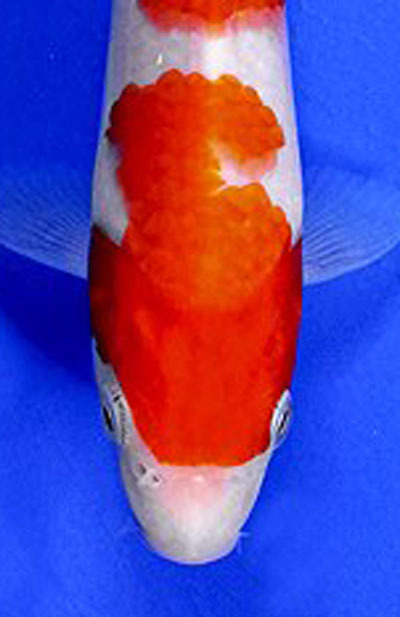 The beni in very young koi starts out as a pale yellow that develops into a faint orange, then a deep orange, and then finally, a beautiful red. Males tend to develop their red as early as their first or second year, however they their color tends to peak and diminish not long thereafter. Though females take longer to develop their red, they are likely to have a truly lustrous red that will last for years, making them more popular among the serious hobbyists. Variations of Kohaku include Doitsu Kohaku, Gin Rin Kohaku, Maruten Kohaku and Tancho Kohaku.